Our first match pits Colby Burnett, Celeste DiNucci, and Tom Nissley. Check out my preview. When first and second tango like this, it’s always a tricky situation. Here are the baseline strategies for each player in this situation known as Shore’s Conjecture. Colby should wager 16,001 if he wants to take control of his own destiny. 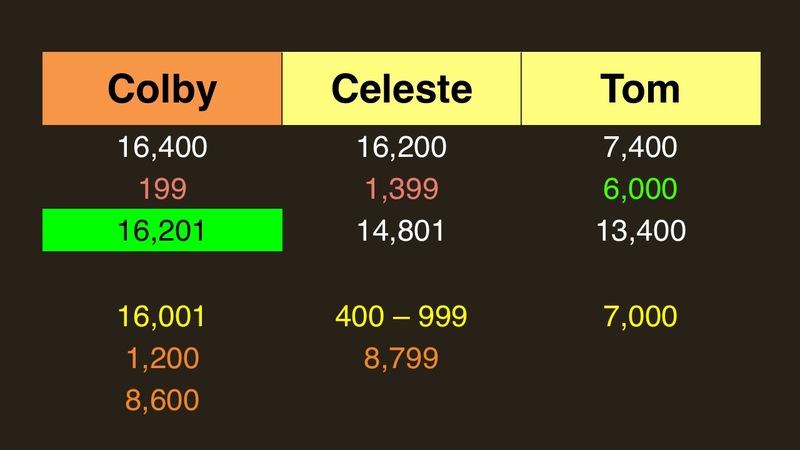 Celeste should wager no more than 1,399 if she wants to keep Tom at bay; alternatively, she can wager up to 8,799 if she’s afraid Colby will wager small. Tom should wager no more than 7,000 so as not to fall below Colby, but is at the mercy of Celeste allowing him back into play. Now, let’s look at some wagers according to Rule #5: the “mind games” aspect of wagering. Only Colby and Celeste will take part in this section. If Colby thinks Celeste will wager 1,399, he could wager 1,200 to cover her. But then, if Celeste thinks Colby might do that, she could wager 999 so as not to fall below him. The problem is predicting exactly how many “levels deep” your opponent will go. 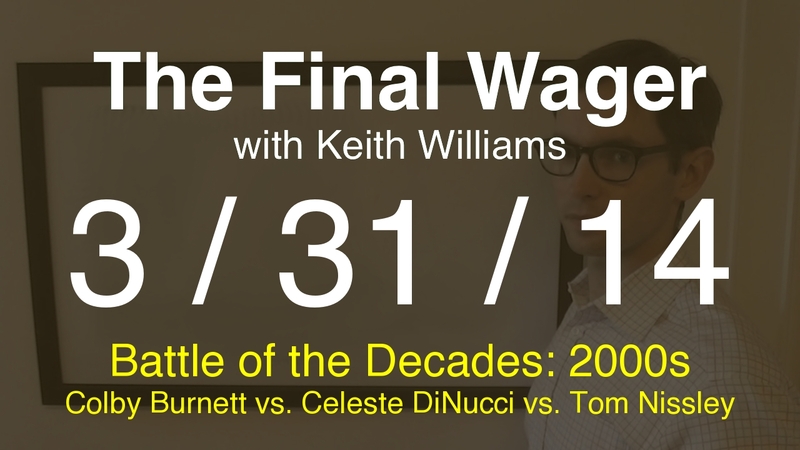 Colby might think Celeste will go for the 1,399 wager, but will fall prey to a 999 wager if they both get it wrong. This psychological aspect is just one one reason Final Jeopardy! wagering is so fascinating. In the end, Colby decided to make Celeste get it right, either due to his own lack of confidence in the category or a hunch Celeste would struggle (I’m guessing the former). Had he correctly anticipated that she would wager 1,399, he could have increased his coin-flipping odds to 75% from 50% with a 1,200 wager – but he decided not to get involved in those mind games. Even if he does play those games and guesses wrong (e.g., he wagers 1,200, Celeste wagers 599) he still has a 50% chance of winning if we reduce this game to coin flips, but of course he probably figured he had a much lower shot. This is why I have my continuation of Rule #3 – this 199 wager is what I refer to as an “unsafe” wager. Celeste could have safely covered it with a wager of 400 (but of course still would have had to respond correctly). Correct response: What is Macbeth (by F.M. Piave)? A quick note on the math: you’ll see that at some point Celeste’s proper response is to wager 199, leaving her a dollar short of Colby’s pre-Final total. Remember how 1/2, 2/3, 3/4 are “wager-to-tie” scenarios? The general formula representing a wager-to-tie situation is any time the scores fall in a ratio of k / k+1, where k is some integer. Here, k = 131, so if Celeste wants to go that deep on the math, she should just wager 200. 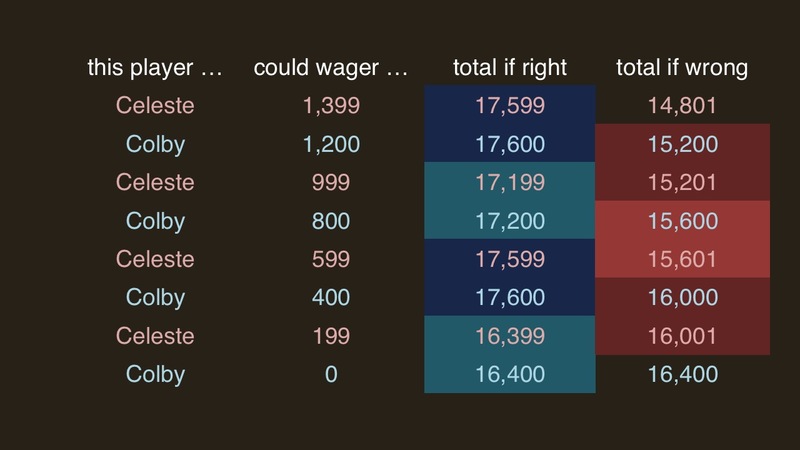 It might be easier to say, especially for close numbers, it’s a wager to tie scenario if the higher score is evenly divisible by the difference between first and second. That’s a good way to think of it! Hadn’t considered that. Thanks!